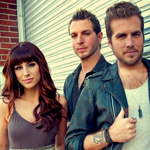 The Pullo Center at Penn State York welcomes Gloriana to its stage on Wednesday, April 24, 2013, at 7:30 p.m. Ticket prices are $40 and $28 and go on sale Monday, January 28, at 10:00 a.m. Pullo Center members can order January 23. Tickets can be purchased at the Pullo Center Box Office, charge by phone at 717-505-8900, or online. Ask any unknown musicians who’ve sweated it out on the club scene — as brothers Tom and Mike Gossin did before moving to Nashville in 2007 and joining forces with Rachel Reinert — and they’ll tell you that having a dream just isn’t enough. Achieving success takes strong motivation to commit, something these three young talents have proven willing to do as their career has exploded over the past two years. From sharpening their live show, to sending a demo to Emblem Music Group owner Matt Serletic (who signed them), to moving in together and secluding themselves for a month to put their stamp on the stellar songs that appear on their 2009 debut album, everything the members of Gloriana have done has been about their passion for creating music. Now Tom, Mike, and Rachel have funneled everything they’ve learned into their second album, A Thousand Miles Left Behind, due for release in Summer 2012. “We’ve grown up a lot as a band,” Mike says. “We’ve honed in on singing and playing together and have really found our sound as a group.” This time around, the group were intent on revealing more of themselves as artists. “On this record, we wanted to tell stories,” says Rachel. “I think people will be able to relate to a lot of these songs because they’re honest and come from a place that’s real.” The result is an appealing mix of up-tempo, good-time numbers: “Wanna Take You Home,” “Sunset Lovin’,” “Go On…Miss Me,” “Doin’ It Our Way,” and graceful, heartfelt tunes: current single “(Kissed You) Good Night,” “Can’t Shake You,” “Turn My World Around,” “Carolina Rose,” and “Soldier Song”. “(Kissed You) Good Night” is climbing the country charts, while its accompanying video (starring Megan Park and Tyler Hilton) had its premiere on ABC Family in January.